The sun was shining over the Cottage in Great Harwoodwhere the Gillbanks were gathering before strong winds picked up in the North West area, this however helping spread the delicious aroma of our roasting hog to the guests and the surrounding houses in Flintshire. Spitting Pig North West arrived two hours prior to serving allowed us time and attention to detail when preparing our secret sweet apple sauce and seasoning. Our 14 hour slow roasted hog sizzled in our purpose built Hog Machine and the guests were longing for our 7pm serve time. Just before 7 we prepared the fresh floured buns, ready in time for guests to indulge in our Slow Roast feast. 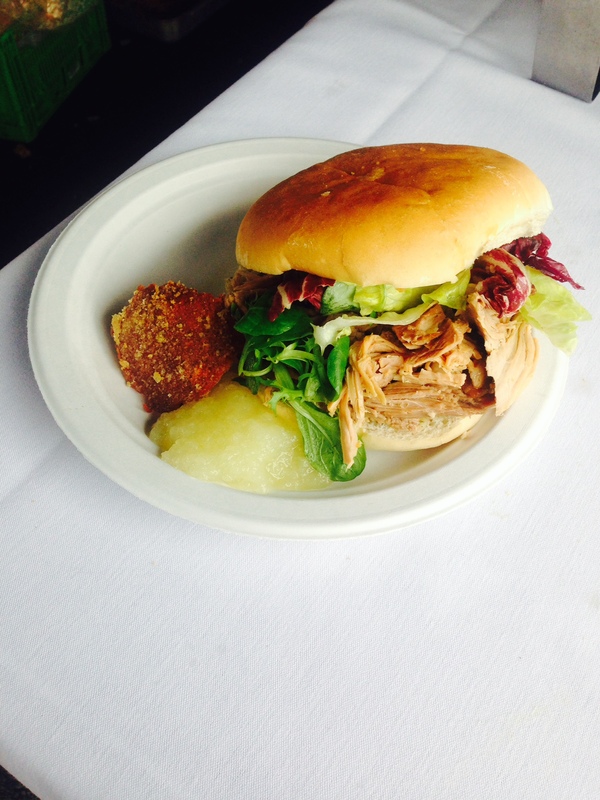 Guests lined up in anticipation to tuck into their juicy pulled pork sandwich, topped with mouth-watering sage and onion stuffing and apple sauce. Those looking for a touch of heat added a dollop of mustard, and nibble on the crisp salted cracking. Smiles all round in Great Harwood as they received their Hog Roast Sandwiches with many of them reappear to the serving table asking for seconds. Great feedback from all guests, with not a single morals of meat left over and Great Harwood was very happy with our service. A job well done for Spitting Pig North West! Hog Roast Tunstall – Leaving Party Before Travelling Around The World!